Maggie Mulubwa in a scene from the movie I Am Not a Witch. Supplied by Curzon. A FILM inspired by stories of actual witchcraft accusations in Zambia will be the next screening from the Maryborough Regional Arts Council Cinema Club. 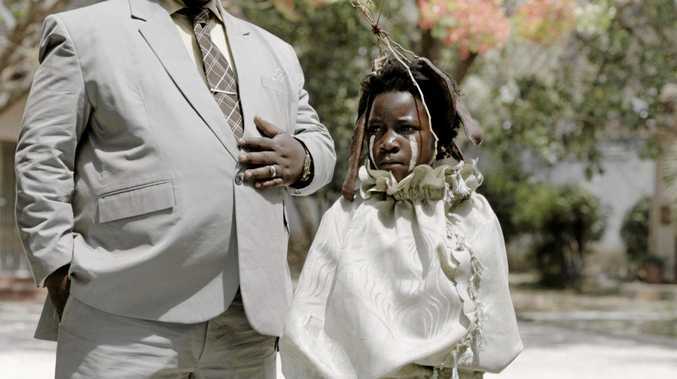 I Am Not A Witch has won a BAFTA Award for outstanding debut by a British writer, producer or director. Directed by Rungano Nyoni, her debut feature film stars Magrul Mulubwas as Shula. Following a banal incident in her local village, eight-year old girl Shula is accused of witchcraft. After a short trial she is found guilty, taken into state custody and exiled to a witch camp. At the camp she takes part in an initiation ceremony where she is shown the rules surrounding her new life as a witch. Like the other residents, Shula is tied to a ribbon which is attached to a coil that perches on a truck. She is told that should she ever cut the ribbon, she'll be cursed and transformed into a goat. I Am Not A Witch will screen on Wednesday, April 10, at 6.30pm in the Federation Room of the Brolga Theatre, 5 Walker St, Maryborough. Cost will be $10 for arts council members and $12 for non members. Drinks will be served after the movie.